Indra Krishnamurthy Nooyi of PepsiCo has a phenomenal career track record! She has smoothly steered PepsiCo over the years through various transformations, and has established herself as one of the reigning monarchs of the business world. Under her headship, PepsiCo has added several brands to its portfolio in both food and beverage sectors. It entails 22 brands, each generating more than $1 billion in estimated annual retail sales. 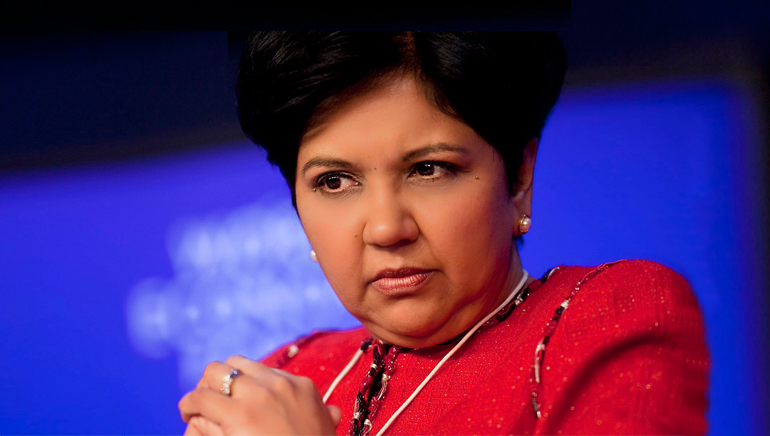 Nooyi created headlines when in 2010 PepsiCo completed a major takeover of the Pepsi Bottling Group and PepsiAmericas. This resulted in the formation of the Pepsi Beverages Company, a wholly owned subsidiary. Nooyi played key roles in the Tricon spin-off, the purchase of Tropicana in 1998 by PepsiCo and the merger with Quaker Foods. She received a bachelor’s degree in Physics, Chemistry and Mathematics from Madras Christian College in 1974 and a Post Graduate Diploma in Management (MBA) from Indian Institute of Management Calcutta in 1976. Before joining PepsiCo in 1994, Indra Nooyi was Senior Vice President of Strategy and Strategic Marketing for Asea Brown Boveri, and Vice President and Director of Corporate Strategy and Planning at Motorola. She also had successful stints at Mettur Beardsell and Johnson & Johnson. Nooyi’s dedication towards her dream and mantra of performance with purpose has gained her many followers. Her quick decision making ability and sticking to the work until it’s got accomplished is admirable. A voracious reader, Nooyi, whenever free likes to strut at her guitar!